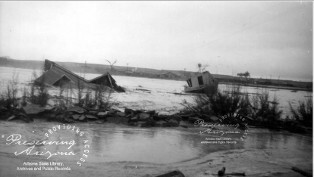 Arizona is known for its droughts, but in the 1920s intense floods occurred across the state. Just one example is the flood on the Little Colorado River that hit Holbrook on September 20, 1923. Photograph of flood waters on the streets of Holbrook (Ariz.).